In 1956, Enman Greene takes his twelve-year-old daughter Penelope out for lunch at a Halifax fish ’n’ chip shop. She believes it’s for her birthday, but Enman has actually brought her there to reveal a secret: the truth about Penelope’s mother. 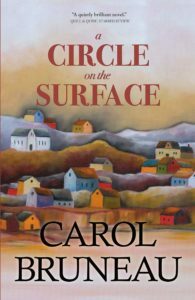 Once Enman begins his story, A Circle on the Surface (Vagrant Press, forthcoming in 2018), the fifth novel by Nova Scotia author Carol Bruneau, sweeps back to 1943 and the fictional Nova Scotia town of Barrein. It’s a time of great uncertainty, not only because of the war that looms over the lives of the town’s inhabitants, but because of the turmoil brewing between Enman and his new wife Una. Una and Enman have moved to Barrein to care for Enman’s elderly mother. Una doesn’t like small-town living, however, nor does she like being caregiver to her mother-in-law, a role which has been thrust upon her largely by default. To escape her growing unhappiness, she spends much of her time wandering the beaches alone, where she encounters a mysterious stranger. Bruneau’s novel abounds in rich language that is often connected to the emotional state of the characters. When Una hears on the radio that Germans like to attack under fog, she muses that she “loved fog, the way, in town, it drew itself like a sleeve up the length of the city’s peninsula,” hinting at Una’s attraction to the intrigue of the German soldiers, and especially the stranger she has met on the beach. The author’s use of imagery also creates a profound sense of place: the sea in particular is ever-present in the lives and dreams of the characters. The setting, in fact, is so detailed and omnipresent that it sometimes feels like an additional character. A Circle on the Surface is told from the alternating perspectives of Enman and Una, but the final section is told primarily from Enman’s point of view. I found this a little jarring because, as the story reaches its climax, the reader is largely shut out from Una’s experience. (This is a distinct contrast from the beginning of the book, which readily shares Una’s perspective.) However, Bruneau’s ending effectively connects the reader back to its true storyteller: Enman, who can never know the real motivation behind Una’s actions. Watch for “Animal Kingdom,” a new short story by Carol Bruneau, forthcoming in Understorey Magazine Issue 14.